COMMunity Beat | Postcard from Barbados! The Barbados study abroad crew, with Professor Ralina Joseph as their fearless leader, has been in the Eastern Caribbean nation for almost a week now. Students were asked to create and contribute to a personal blog on a daily basis describing their experiences, thoughts, and discoveries. While they are contemplating what it means to be in the majority or minority, and studying the race, beauty, intelligence, culture, politics, power, and tourism of Barbados – I (here on the mainland) will share a “postcard” each week from their month-long trip. We kicked off the day in the classroom to prep for meeting our interview partners. Reece led a session focusing on ethnography and interpersonal skills involved in interviewing. We were able to share some of the questions we had for our interviewees and get some peer feedback. After section we shared lunch with our interview partners, who were mostly UWI students. Conversations were flowing all over the cafeteria, and as lunch wrapped up we transitioned into our prepped questions. My partner is a student here at Cave Hill, studying psychology and political science. Our conversation definitely ran the gamut! I got a run-down on the local dance-styles, we talked about Barbadian nationalism, and lack thereof among the younger generation that prefers to identify with American culture. She was so relatable- it’s amazing how a first interaction can feel like you’re talking to a friend. After interviews we made our way to the beach, where Ranell and I decided to take a maritime excursion that landed us way further out at sea than we anticipated… Me with my floatie, Ranell with her super-human swimming endurance, and the sea with a strong current = the rest of the crew wondering if our float went fatal. (SORRY GUYS) When we made our way back we established the need for better communication, this being a Communications program and all. I guess it’s easy to lose track of time when you’re afloat on the Caribbean sea! 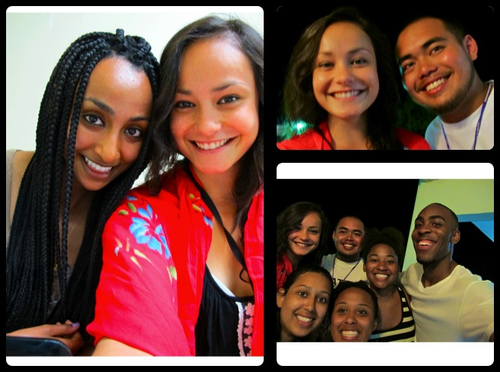 Read more posts from Riley here, and check back next Friday for another postcard from Barbados!